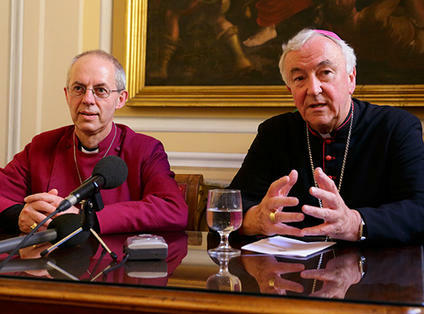 In a joint Catholic and Church of England response to the Government-commissioned independent review of Foreign and Commonwealth Office support for persecuted Christians, Cardinal Vincent Nichols, Archbishop of Westminster, and Archbishop Justin Welby, Archbishop of Canterbury, on April 17, 2019, argued that Government should promote freedom of religion and belief as a fundamental human right. They also called on Government to take a joined-up approach to Freedom of Religion and Belief in foreign, aid, security, trade, resettlement and asylum policy, rather than treating it as an isolated diplomatic activity. The independent review was launched by Foreign Secretary Jeremy Hunt earlier this year and is being led by Bishop Philip Mountstephen, Bishop of Truro. “Christians form an important part of the social fabric in almost every country of the world. Yet in many places, our Christian sisters and brothers face persecution of an intensity and extent unprecedented in many centuries. “This Submission is shaped by their voices and by our commitment to make them heard. “We must remember, too, that these threats to freedom of religion or belief are not restricted to Christians alone. Rather, it is a widespread experience of the followers of other faiths. Many are deprived of this basic expression of their human dignity. Similar threats are also faced by atheists and agnostics who seek to uphold crucial decisions of conscience. The call was echoed by Archbishop Bashar Warda, Chaldean Catholic Archbishop of Erbil, Kurdistan Iraq, where Christians were chased from their homes in 2014 as ISIS took hold in Northern Iraq. Nigeria has also seen significant violence and persecution against people on account of their religious belief.